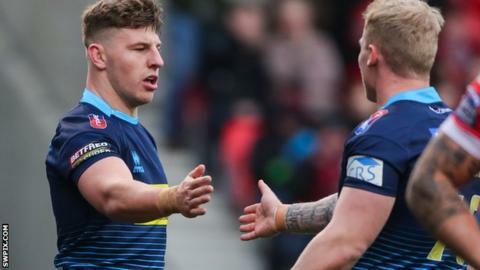 George Williams scored a hat-trick of tries as champions Wigan got only their second win of the season at Salford. The Warriors had won just one of their first six matches and began the game level on points with bottom club Leeds. They trailed fourth-placed Salford early on in both halves, but England half-back Williams crossed for three of his side's five tries. His two second-half scores were set up by winger Joe Burgess, who was back in action after 11 months out injured. Williams' form has been one of several topics for debate during Wigan's misfiring start to the campaign, with head coach Adrian Lam suggesting earlier this month that speculation about a move to Australia's NRL was affecting the 24-year-old's performances. Salford looked set to extend Wigan's poor run when Josh Jones grounded Rob Lui's kick for the first try of the game. Wigan responded with scores from Williams, Thomas Leuluai and Joe Greenwood, but the Red Devils replied with three unanswered tries of their own to turn an 18-6 deficit into a four-point lead. Derrell Olpherts, Niall Evalds and Adam Walker all touched down either side of half-time for the hosts, who would have gone third with a victory, before Williams won it with two further tries to complete his hat-trick. "It's a massive opportunity missed. This one and Castleford away - we feel we should be four points better off in the league table, but it's our own downfall. "They've managed to walk round us on their left edge a few times in the second half, when we felt we had the game back in control a little bit. "We know we can post points on teams, but it's about how we defend as a unit." "The game was an emotional rollercoaster. At 18-6, that probably should have been the game but we made some silly decisions defensively. "The pleasing thing was that, through that adversity, our boys lifted a level and did the job. "George Williams was brilliant with the ball, but he was certainly a long way from his best and put us under a bit of pressure with his kicking game. He kicked two out on the full and some points came off the back of that. "He seemed to get that combination going again with Joe Burgess and Oliver Gildart and that was pretty special - there was amazing footy going on there." Salford Red Devils: Evalds; Olpherts, Chamberlain, Bibby, Sio; Lui, Hastings; Murray, Lussick, Dudson, Jones, Turgut, Flanagan. Interchanges: Griffin, Nakubuwai, Walker, Lawton. Wigan Warriors: Hardaker; Manfredi, Sarginson, Gildart, Burgess; Williams, Sammut; Clubb, Leuluai, Navarrete, Isa, Greenwood, O'Loughlin. Interchanges: Shorrocks, Hamlin, Flower, Bullock.